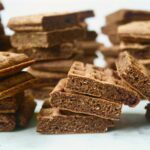 Perfect for any occasion, these spicy Dark Chocolate Waffle Bites are a feel-good dessert or snack that’s elegant enough for a party and easy enough for an afternoon nibble. With whole-wheat flour, little added sugar, a yogurt drizzle, and fresh blackberries, this small bite can’t get much healthier! To kick things up and make these even more interesting, chunks of bittersweet chocolate are added to create pockets of oozing chocolate within the tender waffles while cayenne pepper is tossed in for a spicy warmth that becomes addictive. Ready in just 30 minutes, these are the perfect got-to appetizer, small bite, or dessert for your summer parties. This recipe makes 48 small bites, or 16 waffles, making them the perfect brunch recipe as well. Just top with butter and a sprinkle of powdered sugar and brunch is served! Heat a waffle iron, according to manufacturers instructions, until hot. In a large bowl, whisk together flours, cocoa powder, baking powder, baking soda, and salt. In a separate bowl whisk together buttermilk, eggs, brown sugar, oil, vanilla and cayenne. Form a well in the dry ingredients, add wet ingredients and mix until just combined. Add chocolate and mix to incorporate. Combine yogurt, maple syrup, orange juice, zest, and vanilla bean paste. Coat waffle iron with cooking spray, ladle manufacture’s recommended amount of batter onto iron and close top. Cook until crispy on both sides and easily removes from iron. Transfer waffles to wire rack and repeat with remaining batter. Cut each individual waffle into 4 squares (2-inch squares). Drizzle each square with the Vanilla Bean Drizzle and top with blackberry halves.